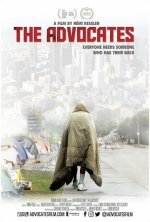 The Advocates release date was Friday, October 19, 2018. This was a Los Angeles release. Over half a million people are homeless in the United States--25% of whom are in California. Amid public outcry over the ballooning homeless population in Los Angeles--nearly 54,000 people on any given night--three advocates with three different organizations show what the lost ideal of “care in the community” looks like amid a changing policy landscape.